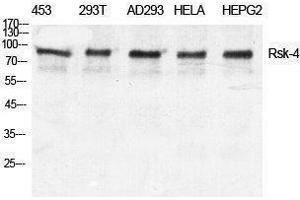 特异性 Rsk-4 Polyclonal Antibody detects endogenous levels of Rsk-4 protein. 产品特性 Rabbit Polyclonal to Rsk-4. 免疫原 Synthesized peptide derived from the C-terminal region of human Rsk-4. 缓冲液 Liquid in PBS containing 50 % glycerol, 0.5 % BSA and 0.02 % sodium azide. 注意事项 Avoid repeated freeze/thaw cycles.